This uncommon name is of Anglo-Saxon origin, and is a locational surname deriving from the place called Edensor in Derbyshire, near Bakewell. 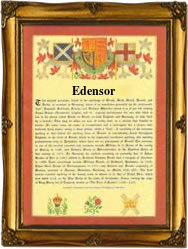 The placename has long been pronounced "Ensor". In the Domesday Book of 1086, the place is recorded as "Ednesovre", and in the 1196 Feet of Fines of the county as "Ednesofre". The name means "Eden's ridge", derived from the Olde English pre 7th Century personal name "Eadhun", composed of the elements "ead", prosperity, wealth, and "hun", bear cub, with "ofer", ridge, bank. Locational surnames such as this were acquired by the lord of the manor, and local landowners, and especially by those former inhabitants of a place who had moved to another area, usually in search of work, and who took the name of their birthplace as a means of identification. One Richard de Edenesore was listed in the Cambridgeshire Hundred Rolls of 1273. The modern surname forms are Ensor, Endsor, Endser and Edensor, and examples from Church Registers include: the marriage of William Ensor and Anne Dyke at Tamworth, Staffordshire, on January 18th 1599, and the marriage of Robert Ensor and Mary Allsopp on December 8th 1663, at Parwich in Derbyshire. A Coat of Arms granted to the family depicts a blue cross engrailed on a gold shield, with a red chief. The first recorded spelling of the family name is shown to be that of Adam de Ednesovere, which was dated 1247, witness in the "Assize Court Rolls of Staffordshire", during the reign of King Henry 111, known as "The Frenchman", 1216 - 1272. Surnames became necessary when governments introduced personal taxation. In England this was known as Poll Tax. Throughout the centuries, surnames in every country have continued to "develop" often leading to astonishing variants of the original spelling.